At the end of July 2013, my husband and I decided to pay off all of our debt, including our mortgage, as quickly as possible. We understood it was a huge endeavor and estimated that it would take us about eight years to do, but we knew the feelings of freedom and achievement once we met our goal would be well worth the dedication, sacrifice, and hard work in the end. We still have a long way to go before we are completely debt free, but in this three-part series, I’ll take you through exactly what we did to pay off over $65,000 from August 2013 through June 2014. Since we had previously calculated our Net Worth, written our detailed goals, and had already been tracking our spending for the past few years, we jumped in to creating our Debt Snowball. The Debt Snowball is where we prioritized the order that we would pay off our debts. We listed the balances smallest to largest, regardless of interest rate. 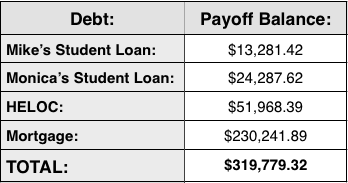 As of August 1, 2013, our debts totaled $319,779.32, as shown below. Our total non-mortgage debt was $89,537.43! We had over $27,000 in our checking account so we decided to pay off Mike’s student loan right away. It made us a little nervous to cut our liquid funds in half in one fell swoop, but we knew that having the “win” of knocking out one of our debts so quickly would provide tremendous motivation for us to see how fast we could pay off my student loan. Mike and I had never kept an ongoing written budget before, but with our newfound commitment to eliminating our debt, we knew we needed one. Being the planner and number cruncher of the family, my heart rate quickened with excitement at the thought of plugging our numbers into a spreadsheet and tracking each expenditure down to the penny. I’ll go deeper into budgeting in a separate post, but for now, here’s the condensed version of how we created our first budget. Since we had been using Mint to track and categorize our spending for three years, we were able to create our budget for the month of August 2013 fairly easily. We plugged in our monthly expenses and estimated our grocery and gas budgets based on our spending from Mint. We allocated $25 for “Spending Money” for each of us and $20 for “Miscellaneous” expenses. We decided that any leftover money would be put into savings as part of our “Emergency Fund” instead of being put toward our debt. Our daughter was due in December 2013 so we resolved to increase the payments to my student loan to $500 each month going forward until she was born and pay the minimum payments on the HELOC and the mortgage. If we ended up needing an extended hospital stay after her birth, we wanted to make sure that we had the savings to cover any unexpected medical bills. After she was born and we were both healthy, we decided to bring our savings down to $5,000 for our starter emergency fund and put anything over that amount toward paying off my student loan. This article is the first in a series. Click here for part 2 and part 3. 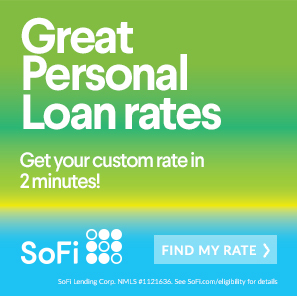 Finally, if you’re reading this article because you want to get out of debt, consider SoFi. They’ve been making some smart moves recently and might be a good refinance option for you. Check them out here or click on the banner below. Participate in the conversation. When you’re faced with an enormous challenge, what do you do to keep from feeling overwhelmed? How do you get started when you know the journey ahead is a long and windy one? Share in the comments below.